The following gallery features Periodical Cicadas (Magicicada sp.) and exuviae spotted at several locations in Accotink Bay Wildlife Refuge, Army Garrison Fort Belvoir, Fairfax County, Virginia USA. This was the first time in 2013 I saw 17-year cicadas from “Brood II” at the park. I recorded three audio clips (~10 s each) of Periodical Cicadas Brood II on 29 May 2013 at Meadowood Recreation Area, Fairfax County, Virginia USA. Meadowood is located on the opposite side of Pohick Bay from Accotink Bay Wildlife Refuge. The sound of a brood of cicadas is astounding and loud — it sounds like a flying saucer hovering overhead! Tech Tips: I used the free “Voice Memos” app on my Apple iPhone to record the cicadas. I used “Audacity,” a free audio processor, to edit the files: I amplified the entire selection for each clip; and added metadata. Finally, I uploaded the audio clips to “Audioboo,” a free Website for audioblogging. Try it, it’s easy! The unofficial motto of the Carolina Wren (Thryothorus ludovicianus) is, Sing it loud, sing it proud! This shy bird can be hard to see, but it delivers an amazing number of decibels for its size. Source Credit: “All About Birds,” Cornell Lab of Ornithology. I shot the preceding photograph of a Carolina Wren during a photowalk through the Hollin Meadows Swim & Tennis Club on 11 May 2012. 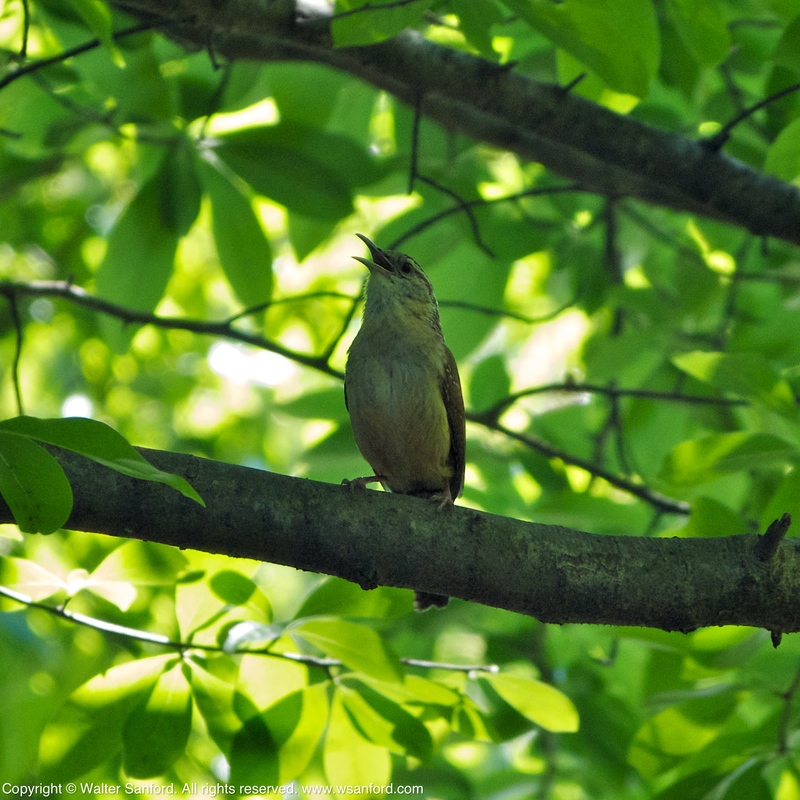 A little less than a year later, I recorded the following audio clip of a Carolina Wren calling in the woods at Huntley Meadows Park on 04 April 2013. If you listen carefully, then you can hear two bird calls: a Carolina Wren is the louder call; a Carolina Chickadee is the quieter call. Tech Tips: I used the free “Voice Memos” app on my Apple iPhone to record the bird call. I used “Audacity,” a free audio processor, to edit the file: I cut some noise at the beginning of the clip; and amplified the entire selection. Finally, I uploaded the audio clip to “audioBoom,” a free Website for audioblogging. Try it, it’s easy! The following slideshow features a few more photos of the same bird. The following slideshow features a female Osprey (Pandion haliaetus) calling its mate. The nesting pair of Osprey was spotted near Riverside Park in Fairfax County, Virginia USA. Females usually show dark necklace across white breast. Source Credit: Osprey, “All About Birds,” Cornell Lab of Ornithology. Related Resource: “Osprey calling its mate (amplified)” – an audio recording of the same bird shown in the preceding photos. This post includes a link to an audio recording of bird calls by the same Osprey shown in the photos! You may be wondering, “How did you do that?” I used the free “Voice Memos” app on my Apple iPhone to record the bird call in situ. Next I used “Audacity,” a free audio editor, to amplify the recording on my Apple iMac. Finally, I uploaded the amplified version to “Audioboo.” Audioboo is a free tool for audioblogging. (Did I just coin a new term?) Try it yourself — it’s easy! Editor’s Note: Audioboo provides three options that may be used to embed a player in blog posts: Standard (HTML5); WordPress.com (Flash); and “If all else fails.” For this blog, the Flash version (shown below) is the only option that displays properly on an Apple iMac computer; none of the options displays properly on an Apple iOS mobile device such as iPad. You are currently browsing the archives for the Audacity category.